During June and July the minimum temperatures in the lower stratosphere were somewhat higher than usual, and the PSC area was also diminished during this period. However, by late September this had turned around, and through mid November, the PSC area generally exceeded those of the past decade. Similar to recent years, PSC temperatures did not disappear before mid November. While from June to mid July the upper levels of the polar vortex area were not as great as usual, from September to December it exceeded the preceding three years on all levels. The size of this year's ozone hole was the largest on record. Its maximum extent, more than 25 million km2, exceeded all the previous years and since the area was so large during many days in late September and early October, the monthly average values of the ozone hole area for September, October and even November were also the highest ever observed. As in 1996, the ozone hole increased rapidly in late August and early September, and persisted as long. 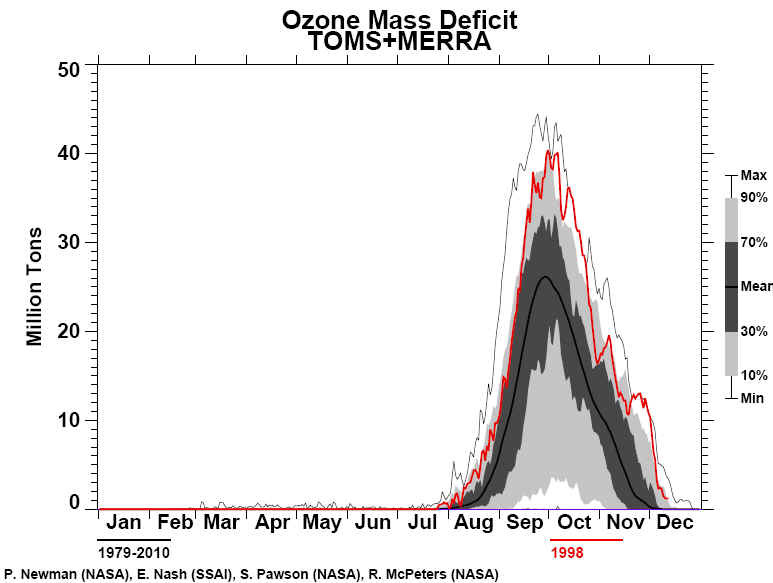 The OMD of the 1998 ozone hole was comparable to 1997, being about 15% higher than in 1996 during September and October. 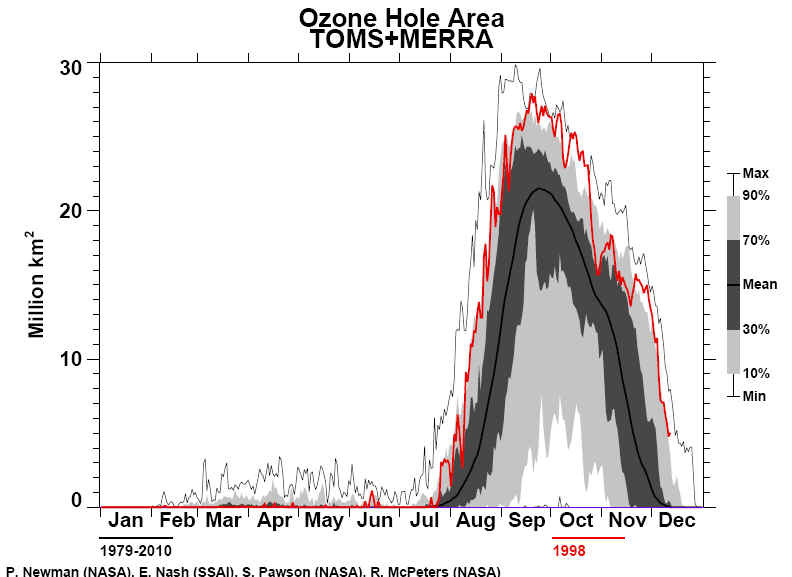 Furthermore, the zonal monthly averages for September, October and November reveal that total ozone values in 1998 over Antarctica were the lowest ever observed, about 45% below pre-ozone hole norms. During September and October, very low ozone values appeared over most of the Antarctic continent. These low values resulted in the area with column ozone more than 50% below pre-ozone hole norms exceeding all previous years from late September to mid October. Some individual stations observed record breaking ozone values during this period and in some cases, lowest monthly average values. 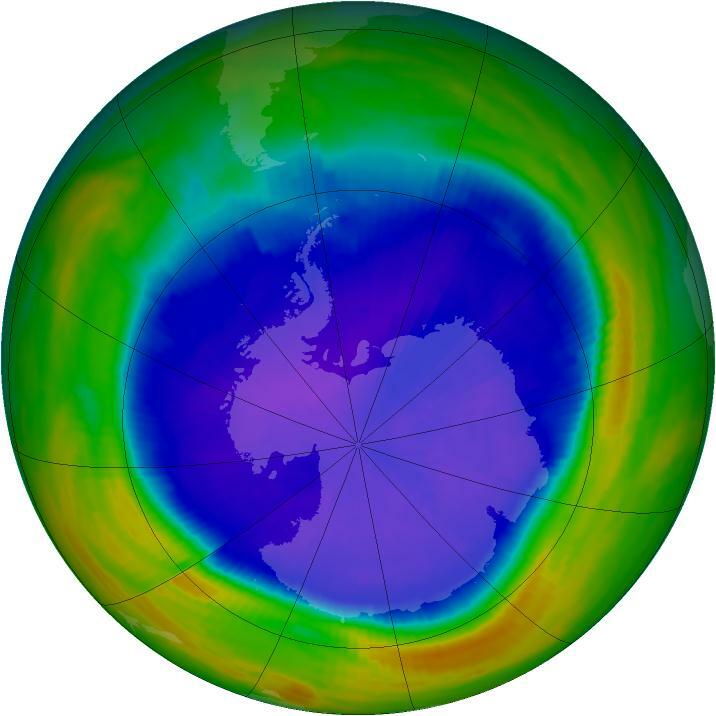 The shape of the ozone hole was quite circular until early October when it changed to slightly elongated. On the average, the southern tip of South America experienced ozone values that were 20 - 25% below pre-ozone hole norms from late September through October, with Ushuaia reporting eight days of ozone hole values. This year's frequent appearances of highly depleted air over Ushuaia was first observed in late August and finally ended in early December. The very late appearances of low ozone values can result in increased UV radiation at the ground due to the more elevated sun in late spring. 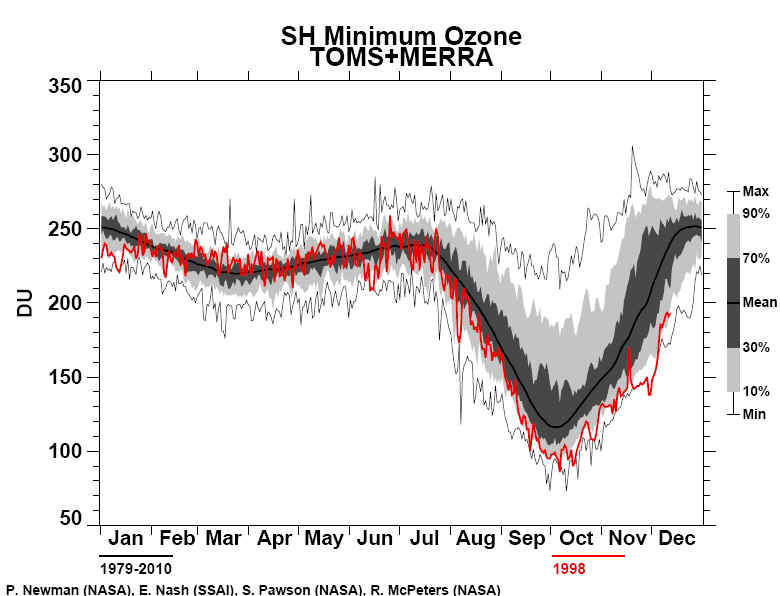 During late October Ushuaia measured ozone values nearly 50% below pre-ozone hole norms. Australia and New Zealand were not exposed to the low ozone values observed in 1997, although on three days in late August and early September, somewhat depressed ozone values were observed over Tasmania and the south island of New Zealand. British Antarctic Survey summary 1998-The 1998 Antarctic ozone hole was broadly similar to those seen in recent years, although a little larger and a little longer lasting. At Halley the final spring warming did not take place until late December and a remnant of the ozone hole passed over the station in late January. Mean total ozone values declined from around 260 DU in early August to a minimum of 120 DU in early October at a rate of around 3 DU per day. They rose a little, but oscillated around 180 DU from late October until the final warming began in early December. Peak ozone values of around 290 DU occurred in late December, but this was nearly a month later and 25% lower than the historical maximum. Values slowly declined from this peak through the rest of the summer. Unusually low ozone values and 100 hPa temperatures were recorded around January 21 when a remnant of the ozone hole passed over the station. Autumn values were around 260 DU, some 15% below normal.